It is nothing new for an artifact stolen from the Baseball Hall of Fame to turn up for sale in a Huggins & Scott auction as there have been a bunch of them sold by the Maryland auction house in the past few years. There have been rare 19th century season passes for the Boston BBC; letters sent to Hall officials by legends like Nap Lajoie and even documents from the famed August Herrmann Papers collection. 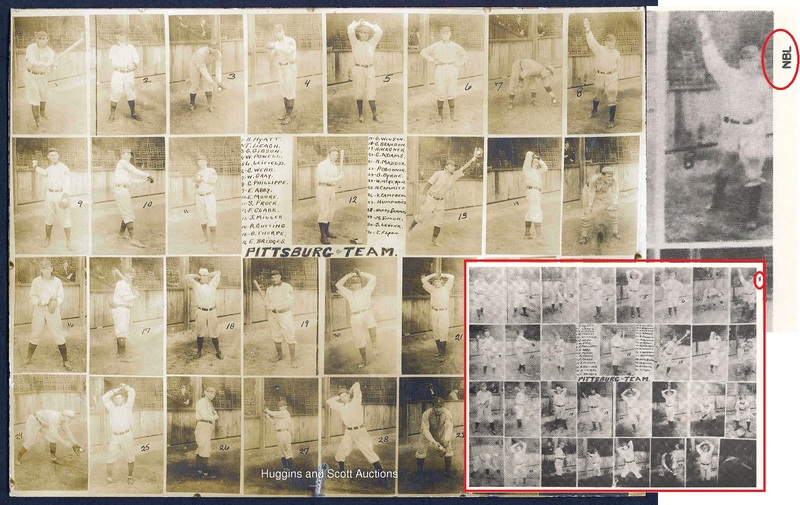 The most recent entry of auction house contraband is the current Huggins & Scott lot consisting of a rare composite photo of Honus Wagner and the champion 1909 Pirates which they describe as: “…the lone example we have encountered.” It is likely the lone example because the photograph is believed to be unique and has evidence of its HOF accession number being scraped off the reverse of the cabinet mount and is the exact same photo that appeared in a Society For American Baseball Research (SABR) pictorial publication dedicated to the Dead-Ball Era in 1986 with a credit to the National Baseball Library in Cooperstown. It’s most definitely stolen and it is also New York State property that the Hall of Fame will likely never claim title to, just as they have failed to take action over the past decade with many other problematic offerings at H&S, Heritage, REA and Legendary Auctions. The 1909 Pirate photo being sold by Huggins & Scott was featured in the 1986 SABR Dead-Ball Era Pictorial (inset) with a credit to the National Baseball Library (top right). At the same baseball card show I purchased another rare photograph that I also discovered had been stolen from the Hall, an 1897 Elmer Chickering cabinet photo of the Boston Beaneaters and the Royal Rooters including super-fan “Nuf Ced” McGreevy and Congressman John F. “Honey Fitz” Fitzgerald posing on the steps of the Eutaw Hotel in Baltimore, Maryland. That photo also showed visible evidence of the Hall of Fame library accession number being removed and defaced on the reverse but more importantly I noticed that the exact same photo with the same creases and damage appeared enlarged as an approximately ten foot by twelve foot image posted on the wall in the Hall of Fame’s 19th century exhibition room. I purchased the photo from New York dealer Ron Vitro who currently works as a consignment agent for Huggins & Scott. I reported my acquisition of both stolen photographs to then Hall of Fame librarian Tom Heitz and returned both photos to the museum along with the contact information of the sellers. The Huggins & Scott auction lot shows the removal of the HOF accession number on its reverse (left). The exact same cabinet photo appears on SABR contact sheets as HOF property via a 1985 photo shoot (right). Since 2010, the Hall’s 1909 Pirate composite photo has appeared along with the 1897 Boston photo on the Hauls of Shame website’s “Recovered Artifacts” section, however, it turns out that the same Pirate photo had already left the Hall of Fame’s possession and was previously offered and sold by Huggins & Scott in a 2007 auction where it realized a price of $3,000. The images of the photo in the 1986 SABR pictorial publication, the 2007 Huggins & Scott sale and the current auction all share unique imperfections on the photographs which are identical. The most pronounced identical damage on each image from 1986 to 2014 is located below the portrait of Honus Wagner at the center of the lower portion of the mounted photo. Images of the 1909 Pirate photo (l. to r.) in 1986, 2007 and 2014 all show the exact same surface damage (in red) on the silver gelatin print stolen from the NBL. Interestingly enough, images of the reverse of the photo from the 2007 and 2014 sales reveals that additional notations were added to the mount since it was returned to the Hall including the year “1909″ and the phrase, “We know not without you Honus.” Huggins & Scott makes no mention of the writing added to the reverse of the cabinet in its current lot description and they also fail to note that the “Fred C. Clarke” inscription appears to be written in Clarke’s own hand. Evidence suggests that the 1909 photograph was actually donated to the Hall of Fame by the Hall of Famer, himself, along with a treasure trove of other items and ephemera. The consignor of the 1909 Pirate photo, Michael Calvello, has also consigned several other fraudulently misrepresented photos to the current H&S auction which he claimed were of Hall of Famer Amos Rusie, Moses Fleetwood Walker and “Shoeless” Joe Jackson based solely on handwritten information fraudulently added to the reverse of each item. An image of the back of the stolen 1909 Pirate photo as it appeared in the 2007 H&S auction. The current offering shows "1909" and "We know not without you Honus" notations (outlined in red) that were added post-2007. 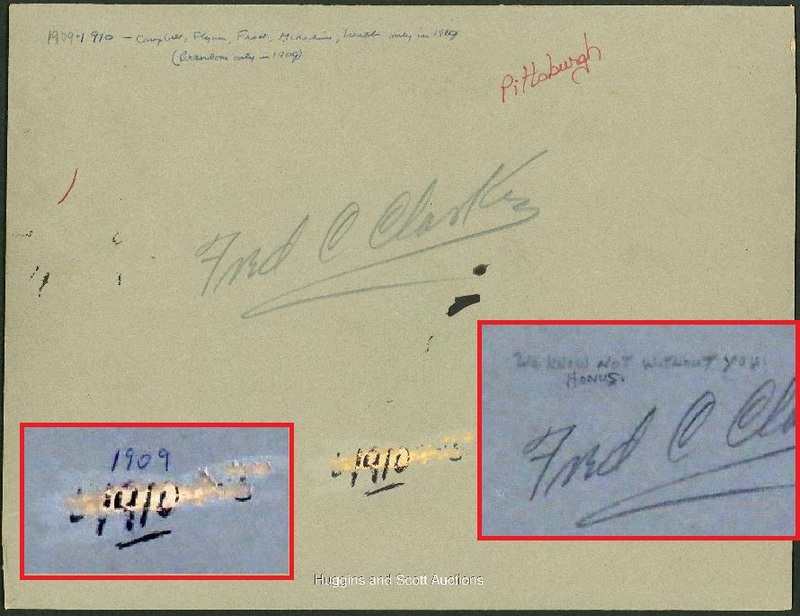 The evidence of the defaced HOF accession number and Fred Clarke's signature are clearly visible on both offerings. Hauls of Shame contacted former Hall of Fame head librarian, Tom Heitz in Fly Creek, New York, and, while he declined comment on the appearance of the 1909 photo in the current Huggins & Scott sale, he did confirm that two photographs were returned to him at the National Baseball Library in December of 1994. Heitz could not recall the exact images returned but did recall that upon the return of the items to the library he drafted and sent a memo to then Hall of Fame Vice President Frank Simio. Heitz’ twelve-year tenure at the Hall of Fame ended just a week after the stolen photos were returned to the library. Since Heitz left the Hall of Fame in 1995 he has been active in the baseball research community and in 2014 was honored by the Society For American Baseball Research with its Henry Chadwick Award. Tom Heitz (left) served as the HOFs head librarian for 12 years and in 1994 accepted the return of the 1909 Pirate photo in the current Huggins & Scott sale and an 1897 Chickering photo of the Boston BBC in Baltimore. The reverse of the photo sold by Huggins & Scott rep Ron Vitro (inset) shows the defacement of the HOF library accession numbers. Idelson and the Hall of Fame have yet to respond to the request which FOIA guidelines state should be answered within five days. All of the information sent to Hall of Fame officials was also forwarded to the Cooperstown Police Department and Chief Michael Covert last Friday. Auctioneer Bill Huggins (center) has been selling New York State property and Hall of Fame President Jeff Idelson (right) has failed to pursue recovery or claim title to stolen artifacts. Huggins & Scott representatives Josh Wulkan and Bill Huggins refused to respond to our inquiry about the photo and who consigned it to the auction back in 2007. Dealer and current H&S consignment rep Ron Vitro confirmed for Hauls of Shame that the 1897 Boston photo he sold in 1994 was, in fact, returned to the Hall of Fame. A call on Wednesday to the Cooperstown Police Department by Hauls of Shame revealed that Chief Michael Covert has been out of the station and will return to his office next week. The current eBay listing of a 1916 letter believed stolen from the HOF includes information about its previous offering at REA and the HOFs failure to claim title to it. The seller ended the sale yesterday and the eBay site says it is no longer available. Hauls of Shame will post updates on the Hall of Fame responses to our FOIA request as soon as we receive answers from the office of President Jeff Idelson. 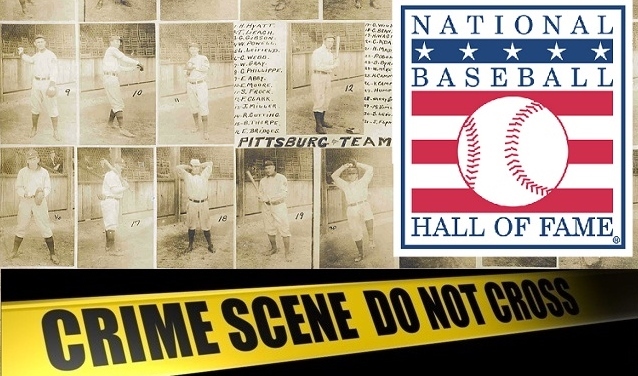 Huggins & Scott Auctions removed the stolen 1909 Pittsburgh Pirate photograph from its current sale while the Cooperstown Police Department investigates the details of the crime that was committed sometime between 1986 and 1994. The exact same 1909 image was photographed at the Baseball Hall of Fame in the National Baseball Library in 1985 and appeared with a credit in a 1986 SABR publication with an ownership credit to the NBL. The consignor of the stolen photograph, Michael Calvello, did not end the auction himself to pursue a reimbursement of the $3,500 from the individual he bought the tainted artifact from this past July. Jane Forbes Clark is the Chairman of the National Baseball Hall of Fame and the sole heir to the Singer Sewing Machine fortune. She is considered one of the wealthiest women in the world and hails from the family that founded the Hall of Fame in the mid-1930s. Her late grandfather, Stephen Carlton Clark, was recently in the news regarding other stolen artifacts in a lawsuit alleging that he knowingly purchased (from the now defunct Knoedler Galleries) a Van Gogh painting, The Night Cafe, that had been stolen from a Russian family during the Bolshevik Revolution. Clark had bequeathed the painting, valued at close to $150 million, to Yale University which was sued by a relative of the Russian family trying to recover the plundered masterpiece. A Federal Judge in Connecticut recently ruled that Yale could keep the painting that was wrongfully seized from the Russian family. The Clark family and the Hall of Fame do not own any of the artifacts housed in its museum and library collections as all donated materials are the property of New York State. The removal of the stolen 1909 Pirate photograph from the Huggins & Scott sale was not initiated by the Hall of Fame which has failed to pursue recovery of stolen items in accordance with state law. These are astonishing stories. An artifact belonging to the Hall of Fame stolen, sold, stolen again, and offered for sale again? Surely I misunderstood. What’s really disturbing is that these stories aren’t astonishing at all; anyone who reads “Hauls of Shame” on a regular basis knows they are part of an endless, ongoing narrative in which unscrupulous baseball memorabilia dealers knowingly receive stolen goods – sometimes engineering the theft of those goods themselves – then turn around and offer them to buyers who are more interested in “feeling great” about “having a piece of baseball history,” even when there are obvious questions about the authenticity or provenance of the items, than they are concerned about doing the right thing and returning the items to the rightful owner(s) when they find out how corrupt the process of acquisition has been. The most painful part of all of this is the realization that officials at the Hall of Fame are apparently unwilling to invest any energy into either preventing or investigating the massive thefts of priceless documents and photographs over the decades. That is indeed a bitter pill to swallow, that the guardians of baseball’s most cherished artifacts seem to care so little about the historic treasures entrusted to their stewardship or about the people who have been swindled into purchasing property stolen from the Hall. Fool me twice – hey look, it’s a baseball game. Golly, if one possesses the proper level of cynicism one might come to the conclusion that certain members of the HOF management are somehow profiting from the theft of irreplaceable New York State property which they are salaried in part by taxpayers to ostensibly protect. Has anyone in the NY Statehouse ever brought this up on the floor of the state congress? Somebody really needs to get a rep to introduce these stories to the congressional record. From what i understand everything the Hall has was donated. They owe it to every donor to track down and recover every stolen item. Kudos to Dorothy Mills for voicing her opinion. I see many big wheels in the SABR world who remain silent. Guess they are afraid of losing funding and getting invited to HOF events. All of these stories of fraud and deceit have left me sick. Having built a collection for 40+ years based on good faith and integrity I can’t believe that the hobby has disintegrated. I have also donated an item to the HOF and would be incensed if I were to see it for sale somewhere. Hauls of Shame is indeed the watchdog of what is left of our hobby. I use the term hobby still to differentiate between collectors who still love collecting and the thieving dealers looking to profit from them. my guess is no one from the HOF wants to admit any items get stolen cause it would make them look bad and incompetent. does anyone really think they would admit to someone stealing valuable items. i don’t think so. So far, the stolen Pirate composite has not been pulled from the auction and is yet to receive the opening $2,500 bid. If all of these items belong to NY State what are they doing? Shouldn’t they be investigating the Hall of Fame? This “let it be” attitude extends to many of the bigger collectors in the community as well. They won’t say a word because they don’t want to bite the hand that feeds them. As long as there is a market there will be a thief. At what point do we reasonably begin to suspect that the powers that be at HOF are aware of this, are themselves secretly the sellers, and that’s why they’re not pursuing it? Hello, I did some homework myself and reached out to Huggins and Scott. They stated they “have not been contacted by the authorities or the Hall of Fame with any police report.” They also stated they will cooperate fully if contacted. I have no reason not to believe them which gets back to the point, why is the HOF not doing anything! Madness. Jeff Idelson and the Hall have not complied with the 5 day response guidelines on the FOIA request and the photo has been reported to the Cooperstown Police, so we’ll see what happens tomorrow. Now the thefts are becoming more brazen. Yogi Berra’s museum just robbed a couple of days ago. No finesse, but a full on assault. I’m guessing the same core of “dealers” involved and these artifacts will end up in private collections never to see the light of day for a long time to come. The thieves at Yogi Berra’s museum probably had a buyer for all those items before they broke into the museum. The items will probably never see the light of day. What a shameful episode in the history of this hobby. If the berra items were hof donations, they wouldnt be investigated if they showed up at an auction house. thats the craziness of it all. Perhaps I missed something along the way. Has the Commissioner of Baseball, Bud Selig been notified of the pilfering of artifacts? If not, why not? Has he turned a blind eye to the matter hoping to sweep the situation under the carpet for his successor Rob Manfred to discover? If I was the Commissioner with a love of history like Selig claims to have, I would have the matter fully investigated. I thought the purpose of the HOF is to preserve the history of the sport, not to sell it off to the highest bidder. Selig is aware of the situation and has done absolutely nothing. Considering one of his fellow owners was buying and selling stolen artifacts from the HOF just makes it worse. Glad to see Huggins and Scott comply and withdraw the item. Now let’s see where the legal process takes us. Hopefully many will be prosecuted and convicted. Time will tell. A shame indeed. Thanks Peter. presents helpful facts to us, kеep іt սp.